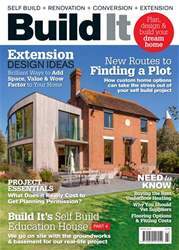 If you picked up the previous edition of the mag, you’ll have read all about the winners of the Build It Awards 2018. The judging process culminated in a fabulous night compered by comedian Miles Jupp – probably one of the most entertaining hosts to date. This annual event has really taken off and has now become the premier self and custom build industry event – just looking around the room I recognised so many leading players in the industry. The evening was superbly organised and hosted.